MSU Extension program instructor Amanda Kruse shows community members how to make black bean and corn salsa at D-Town Farm’s Harvest Festival Sept. 22, 2012, in Detroit, Mich.
Getting out among Michigan residents at a large event proves an effective way for Michigan State University Extension educators and staff members to share their expertise. Health and Nutrition Institute Wayne County staff members served as a resource for nutrition and food safety information at the Sixth Annual D-Town Farm Harvest Festival in Detroit Sept. 22 and 23. Derrick Harrison, program associate (Detroit Central office), Charles Jackson, program associate (YouthVille office), Karla Jackson, program instructor (Western Wayne office), and Amanda Kruse, program instructor and registered dietitian (Lincoln Park office), engaged community members in food demonstrations and spoke out about the importance of eating a variety of foods in moderation, modifying recipes, fitting in physical activity, stretching food dollars and keeping foods safe. They demonstrated making black bean and corn salsa and southwestern black-eyed peas and corn. The festival also included farm tours, children’s activities and “learn-shops” on bee keeping, breastfeeding, gardening, composting and a variety of other topics. Community members also enjoyed live music and heard a variety of speakers. The shopped the farm stand and other vendors. The festival featured health and food authors available in an author’s tent for book signings. 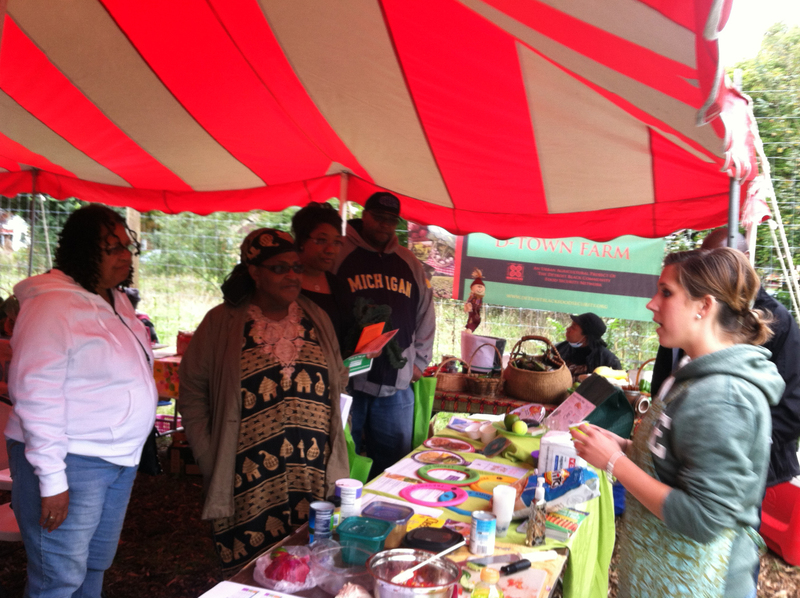 D-Town Farm’s Harvest Festival allows community members to get engaged in the urban agriculture movement happening in their own backyard, specifically D-Town Farm, the 7-acre urban farm located in Rouge Park in Detroit. Read more about D-Town Farm here.